Thank you for sending the great crew from McLean Communications to choose and present the New Hampshire Magazine Award at our Table Talk event. This award is always the highlight of the evening! I certainly did not envy their position. Each table was beautifully crafted, making choosing a winner for any award difficult. Hope your people enjoyed the evening as much as we enjoyed having them. Editor’s Note: We are always happy to be part of Table Talk. Thanks for having us. In the May issue it could be we’re short one newt but, hey, maybe the red (really blue) hawk on page 52 ate it. Oh, I have a friend, Nancy the newt, who climbed Mt. Washington. She says it’s 6,288 feet high and not 6,289 feet as on page 14. Editor’s Note: It was more a case of “Honey, we shrunk the Newt.” One of his appearances last issue was so tiny that not even Sight the Hawk could spot him. After a long, cold, snowy winter, my husband and I just returned from a wonderful vacation in France. We were on a Viking River Cruise from Paris to Normandy on the Seine. One day we were docked in Vernon and I happened to see this sight (see photo). Thought you and your readers would enjoy seeing this. Perhaps the Old Man decided to retire to a milder climate in France. 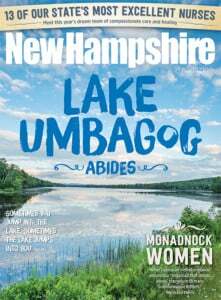 Just an fyi [“Editor’s Note,” April 2015] that there are 424 members of the full New Hampshire Legislature (400 Representatives and 24 Senators). And they are paid (per the NH Constitution: Part 2, Article 15) $200 per term (which is a two-year term). The article [“Artisan,” May 2015] is great. Thank you! You really hit the mark about me and what I do. I really appreciate it.